Life is full of memories were we look back through rose-tinted spectacles and no more so than in the world of whisky. Scapa feels like it’s had more than its fair share. New releases are often belittled only to be heralded as great when the next replacement arrives. Was childhood really the best years of our lives? Is the Skiren really that bad? You might think so from comments on Whiskybase such as “I used a spittoon” and “very artificial”. It doesn’t look good for the poor Skiren but overall I wouldn’t say 80.1/100 was that bad a mark. Jim Murray in his Whisky Bible 2017 scores the Skiren 89.5/100 which classifies it as “very good to excellent whisky definitely worth buying”. This is a better score than he gives for the 12yo, 14yo and 16yo. He says of the taste “major malt which steps on the salivation pedal almost immediately; the tannins are layered, offering some ice cream, including cone.” He concludes with a message to Scapa “chaps who created this: lovely, you really have to power this up a bit.” 46% please! In the video review below, Horst Luening likes the nose and taste of the Skiren but considers it too expensive for a non-aged statement. I would agree but Scapa might argue that, since it’s their only official bottling, its uniqueness is worth paying for. They’ve certainly put all their eggs in one basket and I hope it works for them because I wouldn’t want the distillery to close down. Scapa 1980 25-year-old – 500th blog post! It’s purely by chance that my 500th blog post is about one of the best whiskies in my collection. 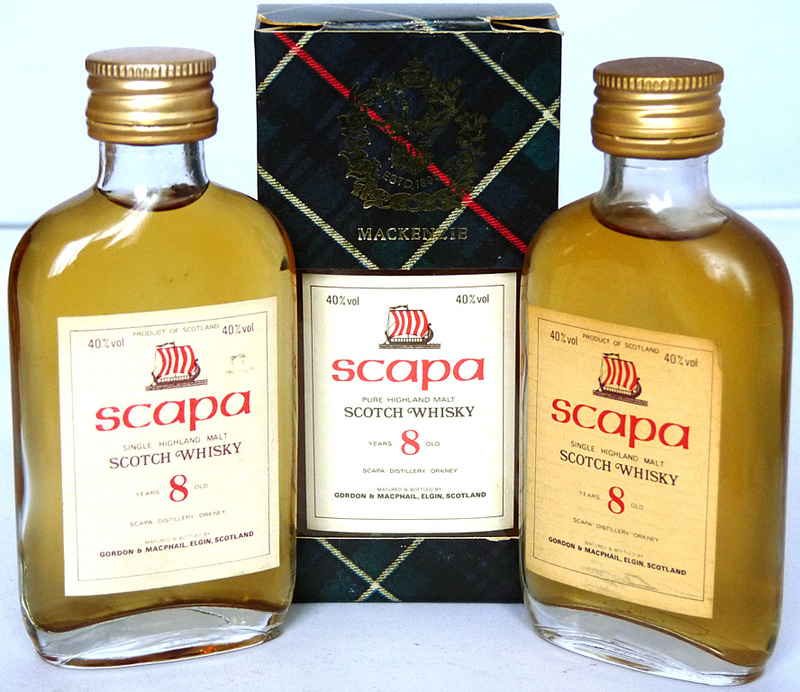 As much as I love Highland Park I have a soft spot for their Orkney neighbour Scapa. Whiskybase list 203 distillery releases from Highland Park but only 16 from Scapa, such is the rarity of direct bottlings. Of the 16 bottles the 25yo gets the best rating with an amazing 89.4/100. I was surprised and delighted to find a video review by Ralfy of the Scapa 14, and 89/100 is an amazingly high mark from him. Compared to the 12yo and 16yo he says the 14yo is his favourite but he admits that it’s more challenging than the 12yo with some sour, bitter notes and a more old-fashioned taste. But if you pour a glass and let it settle, it’s well worth the experience. One thing Jim Murray and Ralfy agree on is the variation of whisky from bottling to bottling of the 14yo but Ralfy felt the standard was always kept high. Saying that, 81/100 on Whiskybase is quite an average mark. Malt Maniacs give the 2005+ version of the 14yo 81/100 and the 2007+ version 79/100, which is again quite so-so. As a long-time lover of the 12yo I’ll be interested to see what I think of the 14yo. It sounds intriguing! With the Scapa 16yo being discontinued this year and replaced by a younger NAS (non-aged statement bottling) it’s nice to know that the distillery used to produce quality at a younger age. This 8yo miniature could be from the late 1970s but, chances are, it’s from the 1980s. The very basic label is a far cry from the sophisticated packaging we see on whiskies today. Having ‘SCAPA’ in red ink – wow! It must have been like getting a Sinclair ZX Spectrum after using the black & white ZX81. Although 83.8/100 on Whiskybase seems better than average, both members who write reviews seem underwhelmed by the taste. The nose suggests promising things to come only for the flavour to be “thin”, “innocuous” and lacking body. I will certainly be returning to these tasting notes when I get a chance to try it. It doesn’t sound like a whisky where anyone would want to hunt down a full bottle but there seem to be plenty of miniatures out there if you fancy this old Scapa experience. The auction website I use for buying miniatures has the same postage for 1 bottle as it has for 20. It therefore makes sense to get as close to 20 bottles as possible to spread out the delivery charge, which is about £14. If the auction ends and all you’ve won are 2 bottles for £10, having to pay £14 postage adds an extra £7 to each bottle. I’ve been stung by this before so I always have back-up bottles to bid on towards the end of an auction. This explains why I bought 3 bottles of this Scapa. It’s a distillery I love, and having 3 bottles means I can drink 2 and still have 1 in my collection! Scoring nearly 80/100 on Whiskybase is a reasonable score. A reviewer, Feusi, summaries this whisky with “caramel and vanilla on the nose, honey-sweet with a touch of smoke and sea. Yesterday and today, a dram from Scapa is always worth the time.” I couldn’t agree more! In recent years when I go back home to Scotland, I always make a point of having a dram from the family bottle of Scapa 12yo. As the liquid level dwindles away, it made sense that I should acquire my own bottle. Having been replaced by the 14yo ten years ago in 2005, the best place to purchase the 12yo was at an auction. I was delighted to secure a 1 litre bottle, which I assume was made for airports and duty free as it’s an unusual size for supermarkets and off licenses. In the Whisky Bible 2015 the review of the 12yo has been reduced to just 3 words – “always a joy” but, back in 2009, the author had a lot more to say about one of my favourite whiskies. Jim Murray describes the taste as “truly brilliant mouth arrival: the most complex delivery of malt and cocoa; the fruit is ripe figs with a thread of honey” and the finish is summarised with “a slight bitterness with some developing toffee, but the malt stays the distance”. 88/100 classifies the Scapa 12yo as “very good to excellent whisky definitely worth buying”. I see that Whiskybase mention ‘The Whisky Exchange’ were selling a bottle for £175 but it has now sold out. There are no shortage of old bottles appearing at auction with winning bids ranging between £40-£60. Last year I went home to my parents in Aberdeen, Scotland and cracked open a bottle of the famous, and dearly departed Scapa 12-year-old. It was as fantastic as I remembered from previous tastings. Each year from now on I’ll make a point to have a glass during a visit. Since nobody else in the family is that interested, it could take me 10 years before I finish the bottle. I wonder how much another one will be at auction by then? Some people say that it will be oxidised and horrible after 10 years but I’ve never found this with old, open bottles of whisky. My dear old uncle Hamish, sadly no longer with us, said to give a bottle a shake to mix the top layer in with the rest, and it’s as good as new. If you don’t, you might detect a slight bitterness from the oxidation from the surface layer. I’ve said in previous posts about being reluctant to get the Scapa 16yo because a) it doesn’t score well enough in reviews, even if it’s supposedly won awards and b) it’s overpriced for what it is. If it hadn’t been for a Black Friday discount allowing me to get the Scapa 16yo for under £40, I still wouldn’t have it today. But I might be doing this whisky an injustice. Jim Murray’s mark in his Whisky Bible 2015 is rather confusing because he gives a different score for a bottle marked ‘the’ Orcadian (which mine is) but says it’s only for the Swedish market. At 87.5/100 it sounds a lot better than the 81/100 he gives to the ordinary 16yo. Perhaps the Scapa distillery realised the whole world deserved the good stuff and not just their Scandinavian ancestors. I still have hope that one day we’ll see a return of the Scapa 12yo to battle it out with other 12-year-olds from the likes of Highland Park, Glenlivet and Glenmorangie, because the distillery has a lot to offer on a wider world scale. As for this 16yo, I will have to take a sample up to Aberdeen and compare it against its former younger brother. I have a feeling I wont be disappointed with the new 16yo. This 20yo was distilled in 1993 and bottled in 2013 at the full cask strength of 58.6%. What I’ve discovered with high alcohol whisky wasn’t what I expected. I thought it would need more water than a standard 40% to tame the fire but it doesn’t. The higher alcohol content seems to extend the finish rather than increase the burn. But adding water is a personal thing, and can vary from whisky to whisky even when they have the same percentage. Just a case of sup-it-and-see! This Scapa is part of the distillery owner’s (Chivas Brothers) ‘Cask Strength Edition’ which also includes similar 50cl bottles for Strathisla (19yo), Glenlivet (17yo), Longmorn (18yo) and Strathclyde Single Grain (12yo) to name another 4. They’ve rather cunningly reduced the bottle size down from 70cl to 50cl to sell around the more wallet-friendly £45 mark. Doing some research on Malt Maniacs, I see that Chivas Brothers have been periodically doing this for at least 10 years under the release name of “Cask Strength Edition”. Definitely bottles to watch out for but I can’t help feeling a little cheated that it’s not 70cl. Part of me would rather pay another £10 and get a full bottle than lose out on 20cl. You just know that Chivas Brothers are packaging it this way for their benefit, not the buyer’s. This is my 3rd bottle of Scapa in my collection and every one has been bottled by Gordon & MacPhail. As much as I’ve enjoyed Scapa in the past, I think it will be many years before I purchase an official bottling from the Scapa distillery. They are simply too expensive for what they produce. The entry-level option from Scapa is their 16-year-old which, when adding postage, would be over £50. Then you consider that Jim Murray says of this malt “to be so tamed and toothless is a crime against a truly great whisky” in his 2014 Whisky Bible. It’s a shame Scapa don’t take a leaf from the book of their Orkney neighbours Highland Park, who have a 12-year-old bottling that can sometimes be found in supermarkets for £25 – half the price of their 16yo! Admittedly Jim Murray isn’t impressed with this Highland Park either but with the £25 you save from not getting the Scapa you could put it towards an excellent malt like the Talisker 10yo! I remember years ago that the Scapa 12yo was excellent, and I believe the 14yo was good too. It’s such a shame that standards have slipped with the 16yo, especially for a distillery that was mothballed in 1994 and was set for closure in 2004. Instead it reopened that year and the 14yo release was a great success. I fear that adding an extra 2 years (making the whisky more expensive) but losing the quality is a dangerous step in the wrong direction for Scapa.